I love putting on a show and being the center of attention. Colosseum lets me do just that while assuming the role of “Impresario”: a show manager, in ancient Rome. The opening of the Colosseum causes reason to celebrate with mighty spectacles being held throughout the whole empire. By clever hiring and acquiring gladiators, actors, animals and props each player aims to create the show of a lifetime. Magistrates travelling through Rome might even visit your arena attracted by the buzz. Which Impresario will draw the most spectators and make his theatre stand tall next to the grand new Colosseum? Colosseum is a bidding, trading and set-collection game. In the course of five rounds players need to prepare and perform shows to attract the most spectators. The earned money then gets re-invested in the player’s ever growing businesses. In the first phase players can buy one upgrade for their theatre or invest in a new “Event Program”. A bigger arena, an Emperor’s loge, the sale of season tickets or a more spectacular show are all crowd-pullers. Save gaining a bonus action, only 5 investments per player can be made so they need to choose wisely. The required elements to fulfill an Event Program can be obtained in the 2nd and 3rd phase, in which players first bid on lots of Event Asset tokens and afterwards make trades. In turn order every player can initiate a bid. Only when the active player wins a bid is the market replenished and play proceeds in clockwise order. The depletion and refilling of the market gives an interesting dynamic to the bidding. Bluffing and proper timing are key. The negotiations during the trading phase are always very tough as gaining the majority in a type of performers attracts Star actors with a loyal fan base. At the same time missing a prop for a show results in a significant decrease in spectators. In the 4th phase it is time for all players to put on a show. At the beginning of this phase each player rolls a Noble Die and moves a Noble accordingly around the board. A Senator, Consul or the Emperor himself attending a spectacle will attract more curious spectators. So ideally players move the Nobles into their own theatre and out of the other player’s arenas. A theatre equipped with an Emperor’s loge has double the chance to attract magistrates, so its proprietor can roll both Noble dice. The real showstopper in Colosseum is the scoring mechanism. A player’s total score is only ever as much as their highest spectator count throughout the game. By consequence you are always trying to improve your theatre and put on bigger shows to best your own score and hopefully all other players’ high score. The 5th and final phase is clean-up, in which all players discard an element that was used in their show. All players receive coins from the bank equal to their number of spectators that round. The player in the lead receives a podium (good for adding 3 spectators to his show in future rounds) and needs to make a donation to the player in last position. With every performance a player’s prestige grows drawing more and more spectators to the arenas. 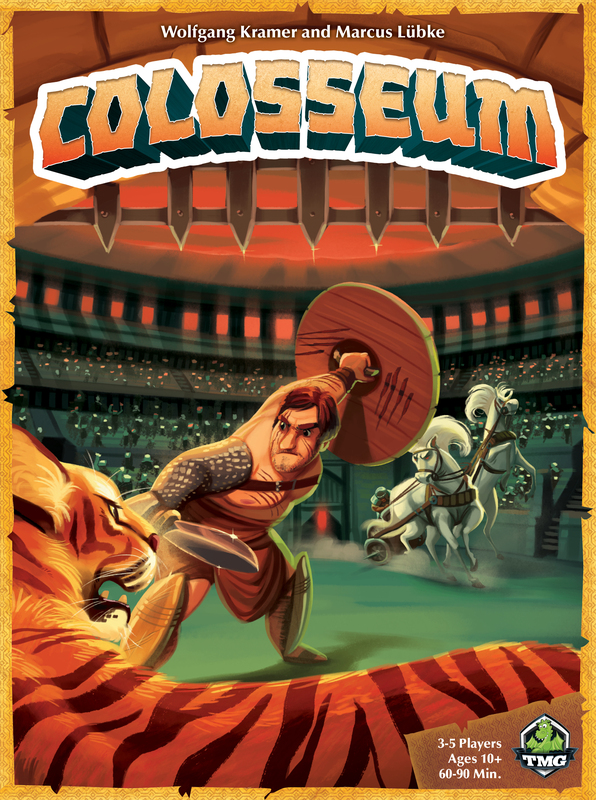 Colosseum by Tasty Minstrel Games is a deluxe version of the game created by Wolfgang Kramer and Markus Lübke, first released in 2007 by Days of Wonder. Over 10 years it kept receiving lots of love and praise, and its scarcity on the market made it one of these so called “Holy Grail Games ”. A remake of something “sacred” is risky business and TMG got a lot of criticism on the new design by devotees. I’m not going to make any comparisons between the original and the new edition as most reviewers do. Gameplay between both versions stayed more or less intact. The artwork is what drew my attention to Colosseum: slightly cartoony with a dramatic feel and deep and vibrant colours. The top notch 3D components make the theme shine bright and make players feel they’re really building and upgrading their own theatre. The looks might fool some people in thinking it’s a true family game, but I suggest you play it with peers instead of with younger children. It’s definitely way more fun if all players are equally experienced gamers. Striking poor deals sets you back a lot. Sealing deals with the included clunky metal coins is a delight. It’s still a dry euro underneath the skin though. Each round players build up to the final phase in which everybody produces a spectacular event. Truth be told, the only spectacles to witness are players showing of their calculus skills by rapidly counting their score for the round. The suspense in each final phase is nonetheless nerve-racking as getting the highest score in any round crowns you the winner. I really love that interesting twist! For some dedicated heavy euro gamers the luck factor might be a bit too high. A good starting hand of Event Asset tokens can sometimes cause for an early runaway leader. The complexity of Colosseum doesn’t lie in the gameplay. The game rounds are structured logically and all rules are intuitive and fit the theme. The crux of the game is bidding and negotiation and this is a human skill that’s not evenly developed with everybody. Bidding and negotiating certainly isn’t my forte. But I love how a board game can offer a safe environment to refine personal skills in a fun and entertaining way. The girl next door that has conquered worlds, built empires and destroyed civilizations. A princess, warrior, psychic or space-chick: always in for an adventure. Sharing my cardboard chronicles on Instagram and ever curious about yours.